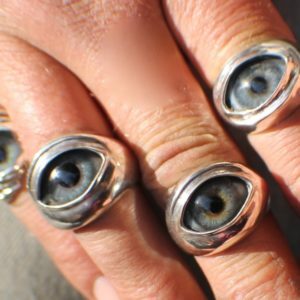 You are here: Home / Jewelry Catalog / Glass Eye Designs / Sterling Silver 2 Hands Prosthetic Eye Ring ~ Order Here! 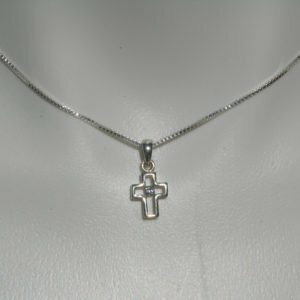 100% Handmade Original Lost Wax Casting in Sterling Silver by Maggie of freedomjewelryusa. 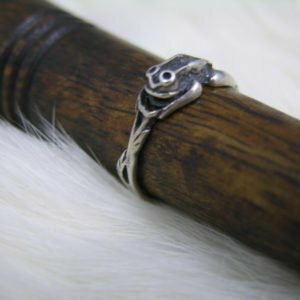 Sterling Silver 2 Hands Prosthetic Eye Ring, made by Maggie of freedomjewelryusa. 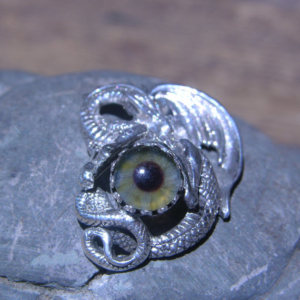 Shown blue eye ring, for example only. Orders taken in eye colors: blue-brown-in between. If you are interested in ordering a ring similar to this, please email me at: maggie@freedomjewelryusa.com for color eye samples. Each ring that I make is a collector’s item and only one of each color/shade/size can be made. 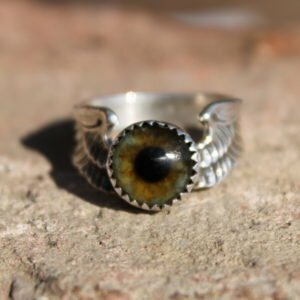 Eye color samples of the prosthetic eye used are emailed for choice for your one of a kind ring. I am a collector of prosthetic eyes and you only find the best here in this design. Every eye is a real antique prosthetic glass eyes, made in Germany or USA. 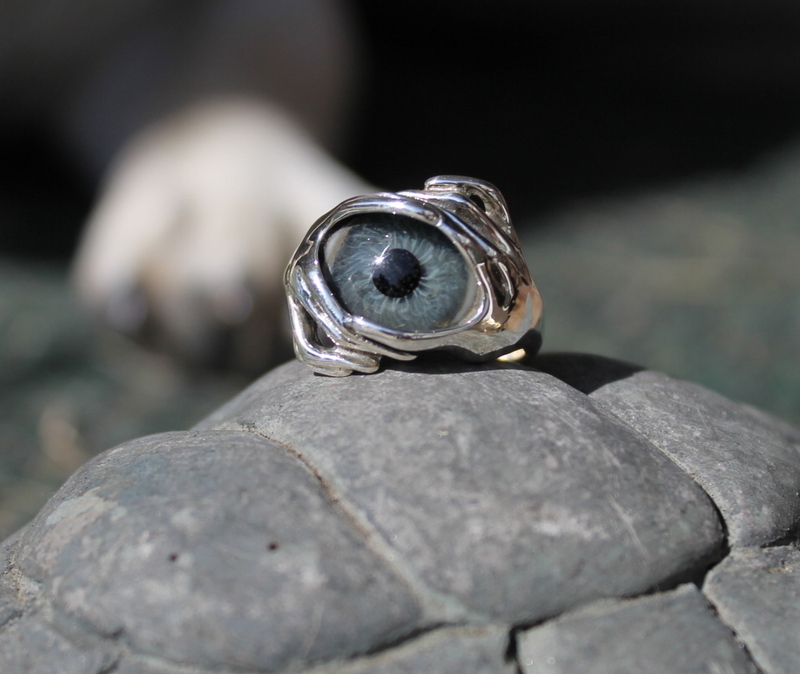 The eyes are hand cut and set into this handmade ring; the ring is created with the lost wax jewelry casting method; each wax is used only once, therefore each ring is just a little different; the design is of two right hands reaching out in a Gesture of Peace holding this Great Eye of the Past and Awareness of the Future. 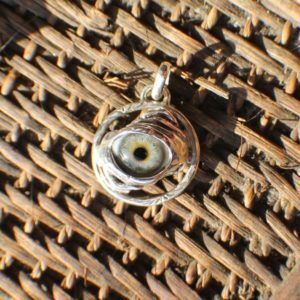 Also known as the “Evil Eye”; this ring symbolizes many thoughts to each person that views this ring. 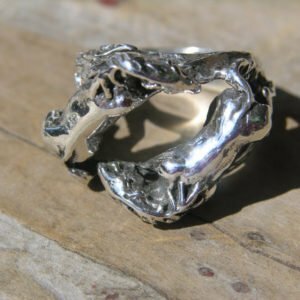 First and fore most is my desire to make these rings and provide a glimpse into my world of what I do. A great conversation piece, very comfortable, requires no extra care and each ring is stamped with my FREEDOM imprint and sterling to guarantee each and every ring. Each ring comes with its own personal polishing cloth to keep the luster finish on the ring. Any glare or blemishes shown on pictures is due to the close up lens I use to capture the detail in the eye. Each eye is set below the line of impact to ensure a lifetime of wear, my own personal guarantee. 10 gram weight finished. Lies low to the finger for everyday wear with a nice wide band for comfort. I do take orders on a timely basis as it could be 2 weeks to finish with choice of eye and ring size. More photos available upon request.